Thredbo has ample off-piste opportunities. What Thredbo lacks in size (480 hectares compared with Perisher’s 1245 hectares), it makes up for in vertical with Australia’s longest trail at five kilometres. Six hours from Sydney, the village is stylish and cosmopolitan – in the bars expect to find more perfect blowdries than hard mountain gear. With more than 30 bars and restaurants clinging to one side of the valley like shimmering snowflakes, and the other valley slope featuring the lifts, there’s no need to remove ski boots during the transition from slopes to après… and dancing. A fresh fall leaves Thredbo looking like a winter wonderland. 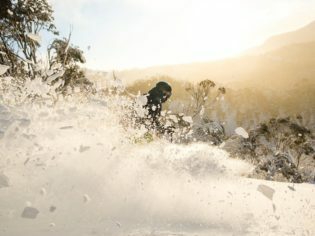 For apartment living, the sophisticated glass and stone properties of The Peak are the pick, the Thredbo Alpine Hotel has location, location, location as the closest to the lifts, or go the whole ski hog and book an entire chalet, Rock Pool Lodge (both booked through thredbo.com.au). Also brand-new to Thredbo this year is The Eastern, architecturally interior-designed self-contained accommodation for a luxe stay. When the slopes cool down, the nightlife heats up. Start with some sophisticated après at The Denman, rub shoulders with instructors at the Black Bear Inn and finish at the Schuss Bar – unless you plan to actually schuss the next day. The snow starts to fall over Thredbo. The drive is 5.5 hours from Sydney. Some accommodation offers parking, while long-term overnight parking is available (ensure your car sports a valid NSW National Park entry sticker). Hot tip: Point your ski tips to the YHA for the best value in the mountains and hunt down the tucked-away Thredbo Ski Museum for historical gems (located below the Kosciuszko Room off the Thredbo Village Square). MORE: Want to try another resort this year?